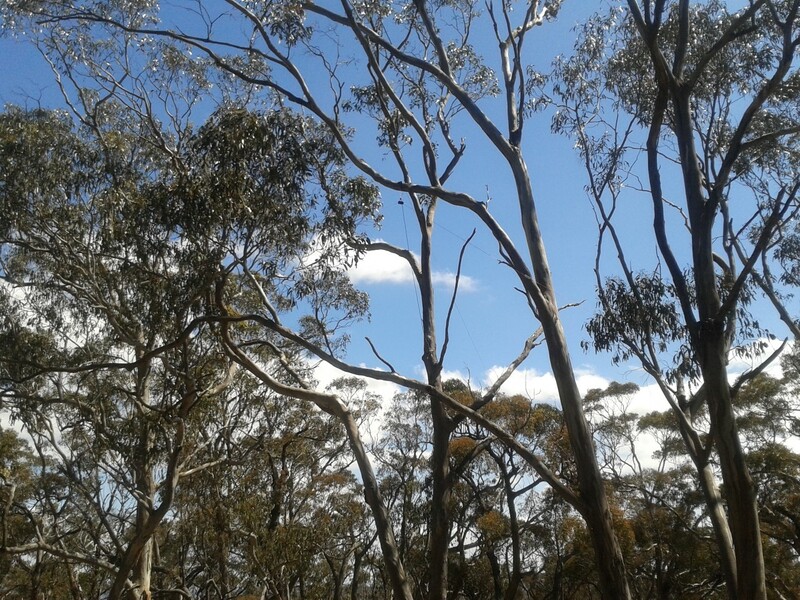 Last weekend was the third annual Keith Roget Memorial National Parks Award Activation Weekend that encourages radio activations from Victoria’s National Parks. I planned to activate two National Parks, from three SOTA summits within them, over Saturday and Sunday. The contacts for the weekend started early with Tony VK3VTH in the Great Otways National Park and Ben VK3FTRV in the Point Nepean National Park active on Friday. 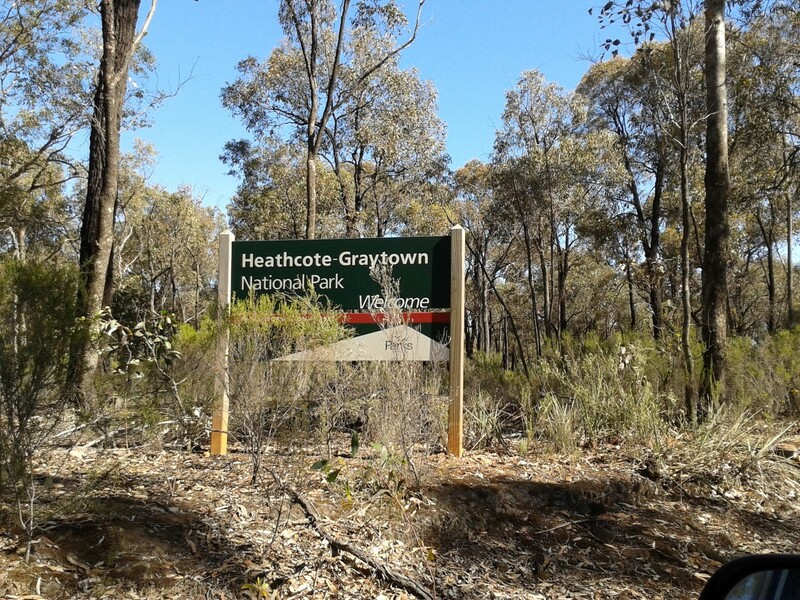 On Saturday morning, while traveling to my first activation, I worked Tony at Mount Eccles National Park, Larry VK5LY at the Hattah – Kulkyne National Park and Joe VK3YSP at the Churchill National Park. 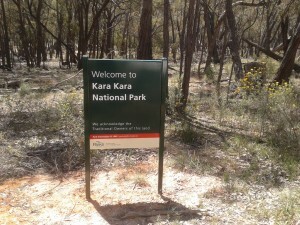 The first activation in Kara Kara National Park was from SOTA summit VK3/VW-013 West of England Range. I accessed the summit from the south, driving along Centre Road from the Barkly Redbank Rd. This track is steep and rocky in places and, while no problems in my RAV4 in the dry; I wouldn’t want to try it in the wet. It took 40 minutes from entering the park to arriving at the summit. I stopped along the way to wait while two stumpy tail lizards crossed the track in front of me. I parked at the corner of Centre Rd and Mt Separation Rd, well inside the activation zone. I loaded up my backpack and head down Mt Separation Rd until I was clearly outside the zone, then returned and set up. I used my linked dipole, hanging from a tree branch in inverted vee with the apex about 10 metres off the ground. My first contact was a summit to summit with Wayne VK3WAM on Ben Major VK3/VS-028 followed by Ben VK3FTRV at Mt William VK3/VS-001 in the Grampians National Park. 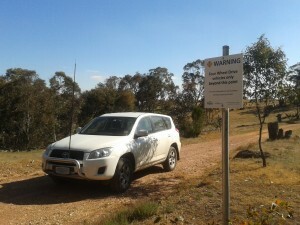 Many SOTA chasers along with Nik VK3ANL at Point Nepean National Park, Paul VK5PAS at Murray – Sunset National Park and John VK2AWJ at Greater Bendigo National Park finished the 27 QSOs from here. I called on 20 m and 12 m however no additional contacts came. From West of England Range summit I continued north along Centre Rd to the next summit West of England Fire Tower, VK3/VW-016. 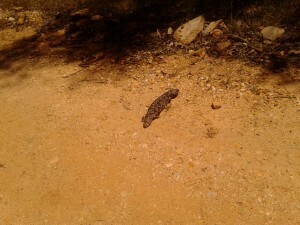 I stopped halfway to work Larry VK5LY at the Wyperfield National Park. Arriving at the second SOTA summit for the day I was again able to drive to the top. I loaded up the pack again and headed in a north easterly direction from the tower across the clearing before following the old telephone line down the hill and out of the activation zone. 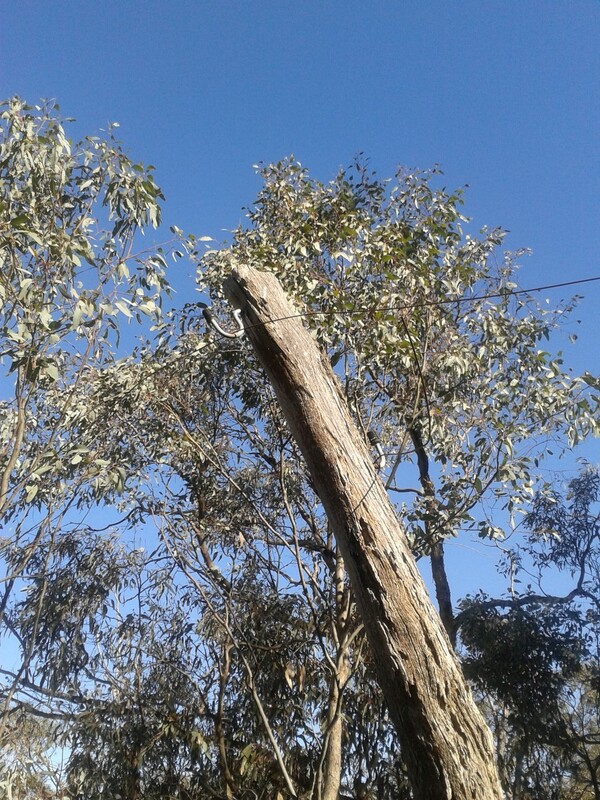 The old telephone line was made of steel wire supported by insulators in the trees and on poles. In some sections the wires is still in the air, in other sections it’s on the ground. Returning up the hill I set up away from my car using the picnic table to support the squid pole and inverted vee antenna. Contacts on 40 metres came quickly form SOTA chasers including Paul VK5PAS at Murray Sunset National Park and Peter VK3YE who was pedestrian mobile on Chelsea Beach. I called for about 10 minutes on 12 metres but got nowhere then moved to 20 metres. As I was about to put out a call I heard a weak QRP station calling CQ. I answered, and through the noise and fading signals, I found it was Perrin VK3XPT operating as E51XPT from Altutaki Islands in the Pacific. Perrin was running an FT817 and an end fed half wave and was quite pleased to have worked a SOTA summit. I also worked three other DX stations – DJ5AV, G0RQL and G4OBK as well as Mike VK6MB. Leaving the hill at about 7:30 pm I headed into St Arnaud for dinner then back to the Teddington Camping area for the night. Waking early on Sunday I left the camp and set up deeper in the park to try for contacts on 80 metres. Andy VK3FRDN answered my call and gave me another activated band for Kara Kara National Park. After signing off with Andy I gave some calls on 15 m and 10 m but no luck. Leaving Kara Kara at 7:30 am I headed east toward Mt Ida in the Heathcote – Graytown National Park stopping briefly at Dunolly on the way for breakfast. 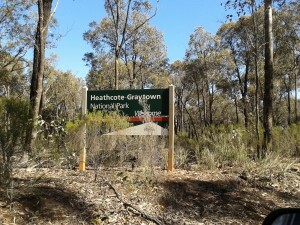 From Heatcote I headed north along the Heathcote – Costerfield Rd, turning left into Plantation Rd then left into Rodney Track. I followed Rodney Track around to the left where the track heads west and up hill before turning to the north in a valley. 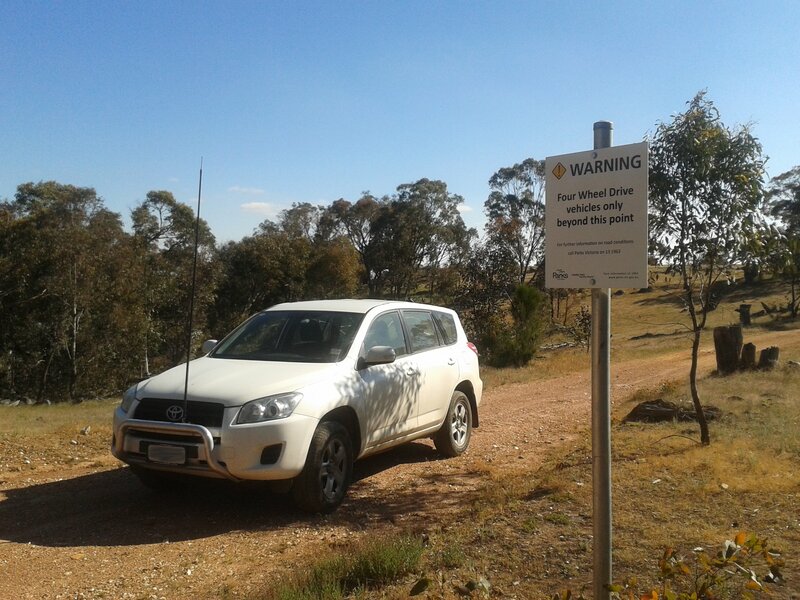 I parked here and, loaded up with my radio gear, headed west up an unnamed track to Mt Ida Track. 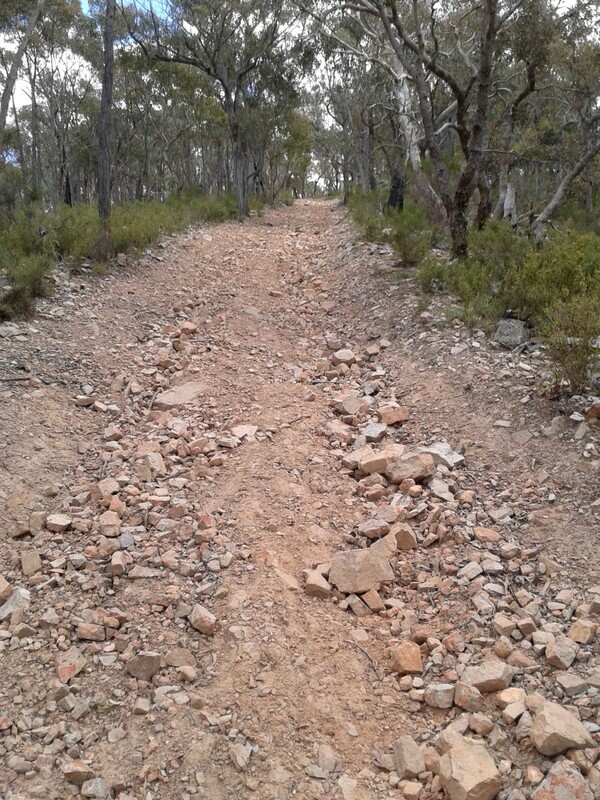 This unnamed track starts with a gentle rise then rises up 90 metres in a distance of 500 metres followed by a gentler rise to the Mt Ida VK3/VU-009 summit. From bottom to top took just under 40 minutes. I activated from the trig point of Mt Ida during the 2012 KRMNPA weekend but decide to work from a little below the peak where I could shade from the sun. 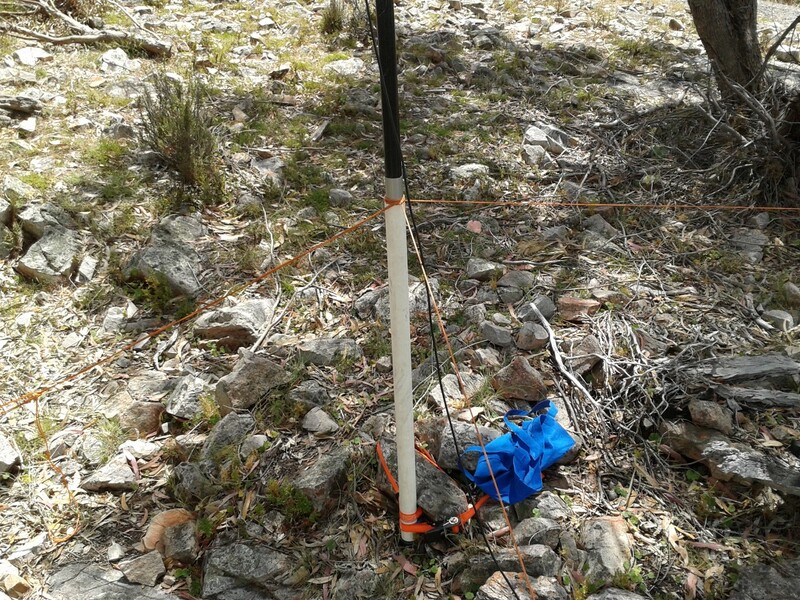 I set the squid pole among some rocks using the ratchet strap to anchor the base and three guy ropes to stabilise the top of the bottom section. 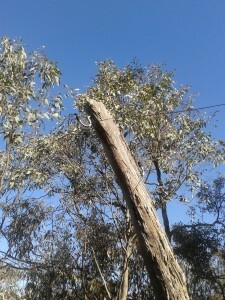 I was on air just before 11:00 am and managed a summit to summit QSO with Andrew VK1DA on Spring Hill VK2/ST-036 just before the UTC change over. 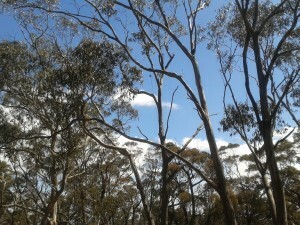 I stayed on the summit for almost two hours with notable contacts to Tim VK3MTB at Morwell National Park, Joe VK3YSP and Julie VK3FOWL in Dandenong Ranges National Park, Larry VK5LY at Murray Sunset National Park, S2S with Andrew VK1NAM, Al VK1RX and Ian VK1DI at Mt ClearVK1/AC-014, Tony VK3VTH at Lower Glenelg National Park, S2S with Peter VK3PF at Mt Oberon VK3/VT-060 in Wilsons Promontory National Park, Paul VK5PAS at Wyperfield National Park, S2S with Glen VK3YY at Spion Kopje VK3/VT-040 and 12m contacts with Mike VK6MB, Glenn VK3YY, Tommy W7RV and Mike AD5A. Leaving the summit just before 1:00 pm I was back at the car at 1:30 pm. 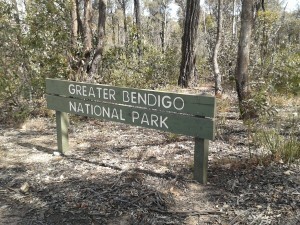 With the afternoon still young I decided I could squeeze in one more park, without a SOTA summit, and headed off to Greater Bendigo National Park. 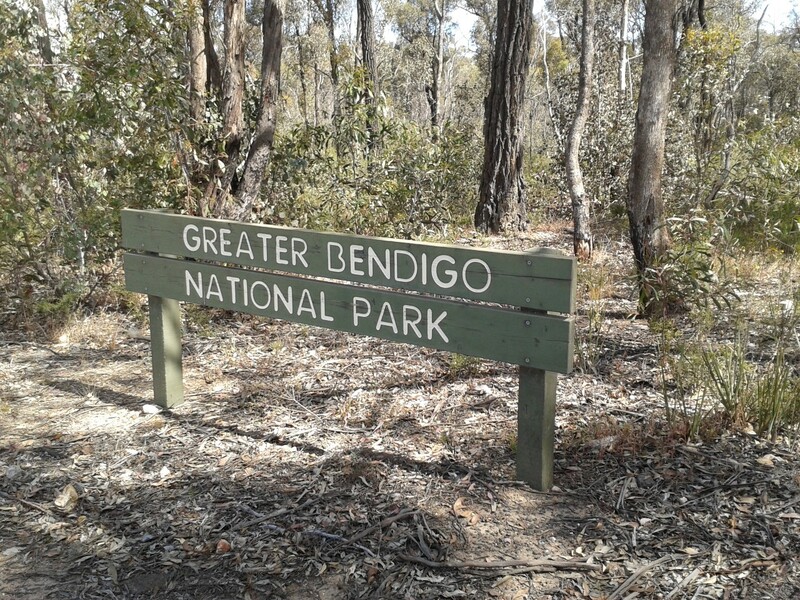 I set up in the Greater Bendigo National Park, just behind the trotting track, and was on air QRP at 2:35 pm with Tim VK3MTB at Tarra-Bulga National Park followed by Joe VK3YSP and Julie VK3FOWL at Dandenong Ranges National Park, Allen VK3HRA at Mt Tambortitha, VK3/VT-011 in the Alpine National Park, Glenn VK3YY at Macarthur Spur VK3/VT-039 and Bernard VK3AMB at Kinglake National Park. 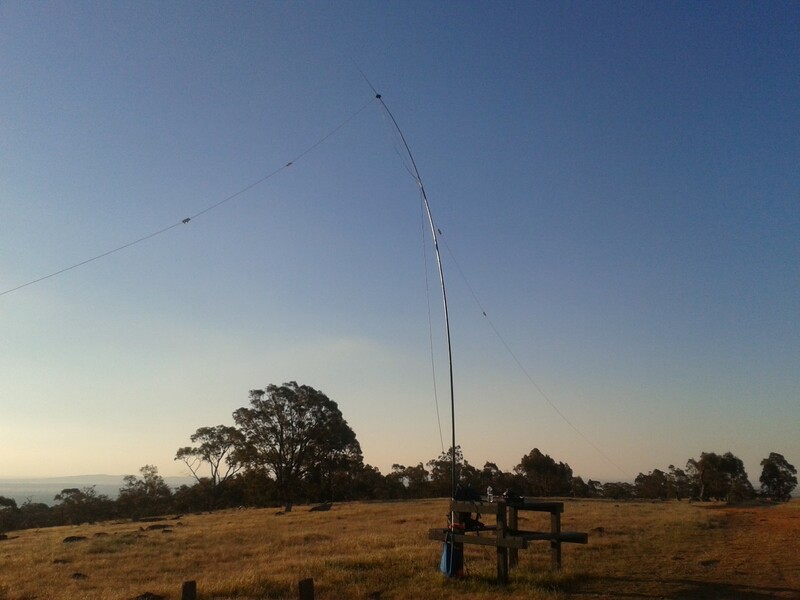 Moving to the FT757 at 50 watts I worked Bernard VK2IB at Mt Granya VK3/VE-165. I also made 16 other QSOs on 40 metres with other National Park chasers and members of the Ballarat Amateur Radio Group who were holding their annual field day contest. At the end of the weekend I managed 114 QSOs to activate 3 National Parks, activate 3 SOTA summits, chased 14 National Parks, chase 12 summits, including 7 summit to summit QSOs. Highlights of the weekend were QRP DX QSOs into Cook Islands, USA, Germany, England and New Zealand. This entry was posted in KRMNPA, Radio awards, SOTA. Bookmark the permalink. This was a really good fun weekend. My wife Marija & I really enjoyed the trip away & we will be participating again next year. It was good to get you in the log a number of times, and your signal was always top notch whilst I was in Murray Sunset NP & Wyperfeld NP. Well done on the blog…it was a good read. And congratulations on the DX that you worked. Well done on the SOTA DX contacts. Great write up, enjoyed reading about your adventures. Thanks for the summit to summit between Mt Ida and Mt Clear. The picture compliments the summit to summit with a view of your operating conditions.